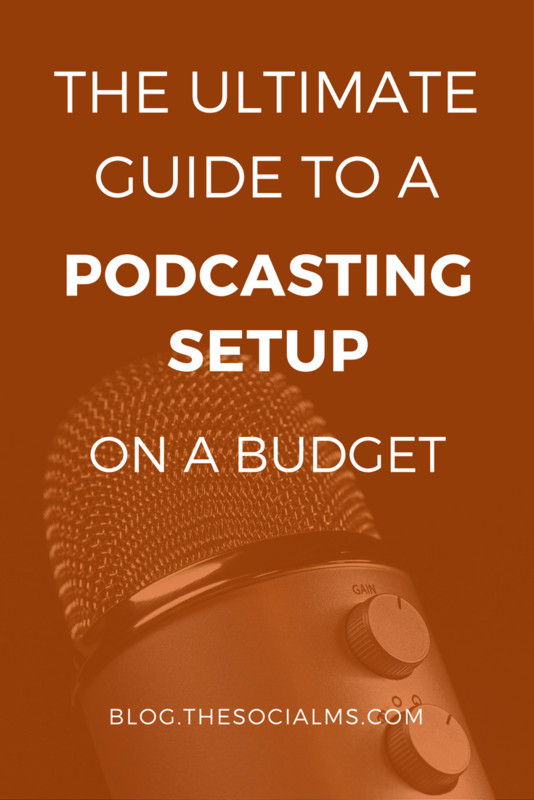 Ok, so you want to try podcasting? Great, it’s fun. It’s also expensive to get into – at least if you follow the various guides that I found on the web for getting started. In my opinion, all these guides I found were basically complete BS. Why? Because they either say: Invest thousands, or invest nothing. Both are wrong! So here is my guide to the equipment you really need to get going. When you are starting out with podcasting, you are entering a new world, exploring a new type of content, and learning new stuff. What you need is a guide that allows you to progress and up your production quality with the new things you are learning. And that is why I decided to create this guide. I’m still learning – if you want to listen to the results of my podcasting journey – listen to some episodes of The Traffic Generation Podcast. When I started The Traffic Generation Podcast, it was an experiment. I wanted to try out the medium, get comfortable talking online, do 10-minute shows once in a while. I wasn’t planning on getting famous with it. I also wasn’t planning on spending lots of money on something that probably would only last a couple of episodes. An expensive Mic. At least a $60 USB mic. Software. Use Garageband or Audacity for free. Intro Music: buy some music… $30 to $100, sometimes more. That’s a barebones setup for a bad podcast. Anything less and you shouldn’t even start. For a better setup, these sources claimed anything from $300 in Hardware (XLR Microphone, Mixer or USB Audio Interface) to 1000s of dollars in hardware, studio setup, and more. I couldn’t justify putting hundreds of dollars into getting equipment. Mixers, Microphones, Audio Interfaces, Software, do you really need that? I just need my voice recorded into the computer on my desktop, load it into something like GarageBand or Audacity, add some Intro music and I’m ready to go, right? Well, this approach does work – kind of. But it also had a part in me stopping my podcast and then waiting almost half a year before relaunching it with a better setup. I used my Gaming Headset to record my voice and well: I recorded my voice. I loaded the files into GarageBand on my Mac – which I got for free. I added some intro music from GarageBands library – and off we go. Uploaded to Blubrry podcast hosting, which starts at $12 per month and then off you go. GarageBand did give me some barebones tools to clean up the audio. This went well for a couple of episodes of the podcast. Actually six. But. While my listeners didn’t seem to notice the crappy production quality, I did. And after a couple of episodes, I really couldn’t cope with it anymore. That was one of the reasons why I stopped podcasting for a while. Because what you will find yourself after a while is that you really have not a lot of ways to improve your podcast’s technical quality. Did I just say there is not much you can do? Well, there is one thing you can do! Level all voices on your podcast – so if multiple voices are talking – after Auphonic’s processing they are magically the same volume. Add compression and loudness control to your podcast (if you don’t know what I am talking about, I will explain this later). Auphonic is a freemium model – you can process 2 hours of audio for free every month, if you want more, you can pay a small free. 2 hours is enough to get you started – should you need more, prices are cheap enough to be worth it! With Auphonic, you can get started with a headset. You could even get started with your phone – and I mean that. I found Auphonic through someone who recorded his podcast while walking his dog – and the sound quality was ok. I wasn’t marvellously professional – but well worth listening. And Auphonic does provide an App for iPhones and Android phones, so you actually might give that a try. This is what I would recommend for the absolute beginner – because Auphonic allows you to start podcasting with ok quality without investing. Just use what you’ve got at home and see whether you like the medium. Don’t buy that $60 USB mic – in most cases that won’t last you long anyway. Go for Auphonic! But what if you want to take the next step? When you want to get more professional, is it then time to go for the $60 USB mic? So, if the slightly improved audio quality is all you want, go for it. But even if you think that is all you want, sit down for a minute and continue reading. Because I’m not sure that is all you want – and I don’t think you are either. Do I want to continue podcasting? How do I want to continue podcasting? Will I just do this one podcast forever? Will this podcast change? Will I do interviews in the future? Do I want my podcast to grow? Do I want to do live shows at some point in the future? Depending on your answers to these questions, you might think about a different route. Even on a very limited budget. I want to continue podcasting – but I am not quite sure what I want to achieve. I actually might want to do more shows in the future – and I have an idea for at least one show that I would like to do and grow big. Really big (a man’s got to have dreams, you know…). However, I don’t want to do live shows – it will always be recorded and published later. Simple reason for that: I am in Germany and International time zones don’t play well for that. 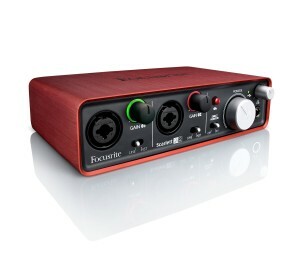 Something called an Audio Interface – or a Mixer with a built in Audio Interface with at least one XLR input. At least one Microphone with XLR port. Your computer should be able to run a current operating system; and have decent but not extraordinary specs. It doesn’t matter whether you have a PC or a Mac. Although you need to make sure that the drivers for your Audio Interface are available! Better sound quality – you are going to listen to your show, and believe me, you are going to begin hating your voice very fast if your soundcard and headphones are crap. Low latency recording – when you want to record your voice while listening to it on headphones that is important. That slight delay in normal soundcards makes monitoring impossible otherwise. You’ll get distracted! You need an Interface with ASIO drivers for that for Windows. For condenser mics, you also need phantom power. XLR inputs allow you to use professional Mics. I said that this is about podcasting on a budget, right? Well, if you go searching for an Audio Interface on Amazon without knowledge, you will find that they easily cost $200 – which is why I got one used from eBay for 25 Euros. If you don’t want to go that route here are a few recommendations for new ones that don’t exactly break the bank. If you are planning to have more than one voice in your studio – you need more XLR inputs for more Mics. That will easily get more expensive. Note – I’m not an Audio Guru – haven’t tested any of these myself. I bought an old interface from eBay. But all of the products below tested well with various audio guru magazines. They all fit professional musicians, so they should play well with podcasting on a semipro level. 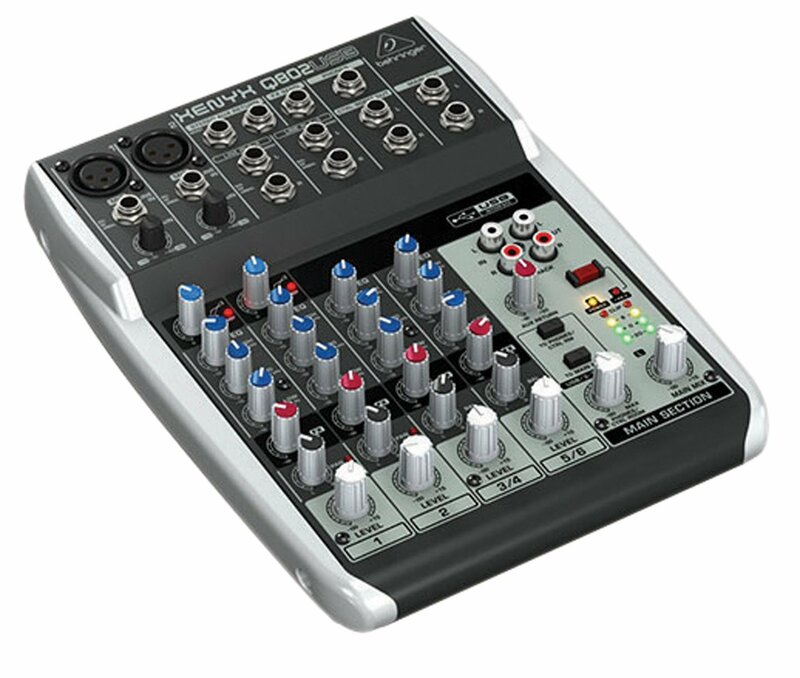 Behringer Q802USB 8-Channel Mixer – with built in USB interface – if you want to go for live shows you might need a mixer, but then this one might be not enough anyway… still might be worth a try! Whatever Audio Interface you buy, make sure that there are available and current drivers for your operating system. Especially when you buy an interface on ebay. I said that I wanted to switch to a more studio-like environment – not to a full studio. You don’t need 400 Dollar Microphones at this stage. They probably sound great – but right now, almost any microphone will sound great in comparison to what you podcasted on until now. You have two options: a Dynamic microphone or condenser microphone. Dynamic microphones in the lower price range are often used on stage by musicians. They don’t need phantom power, but their pickup patter is less sensitive than of most condenser microphones. 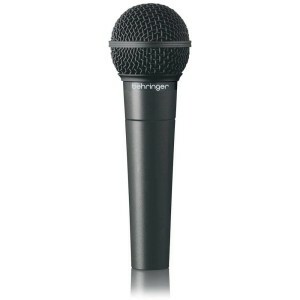 Condenser microphones are more sensitive, require phantom power and often have a bigger dynamic range. Their sensitivity also means they will pick up more room noise. 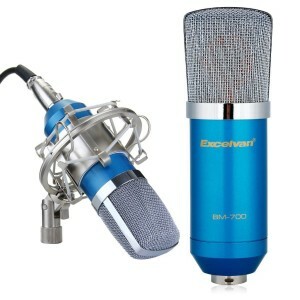 Now, high-quality radio and podcasting microphones are very often dynamic microphones, but these are in a different price range. They start at around $150. If you are going for a cheap option, you are probably looking for condenser microphones, or alternatively at microphones that singers use. The important fact here is that you can always upgrade once you know what you want. This is the versatility you get with a dedicated audio interface. Here is what I did: I got a cheap Chinese made condenser microphone from Amazon. I did a lot of googling and the one I got is probably the best you can get for the price. It’s the BM-700, and you can get it from a variety of brand names. It sounds ok for the price. And you can tweak the sound quality in your software easily. Whatever you do – you need to know one difference between these two types of microphones: Most dynamic microphones have a cardiod pattern originating from the top of the mic, that means when you talk you speak into the top of the mic. Condenser mics either are nondirectional meaning there is not much change all around, or they are set up so that you talk into one side of them. BM-700 by various different companies – Not great, but currently good enough. My choice. A definite step up from the Headset. Sounds quite good actually, it is pretty quiet compared to other condenser mics – the high frequencies are a bit more pronounced than they should be, but this can be fixed quickly in software! 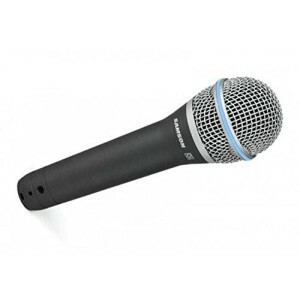 All of the mics below are similar to one of the most popular microphones in the world – the Shure SM-58. You can podcast with all of these – but whether their sound is for you, you have to decide for yourself. They all have the same looks and probably even sound similar. 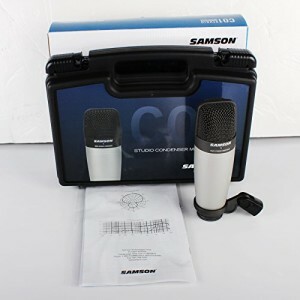 Samson Q7 – Many reviewers say it is at least as good (or better) as the SM-58, for a fraction of the price. Quality on Mics is really something you have to hear and decide for yourself – but there is no way around this being a decent mic for a really good price! Samson Q8 – This is the top level of the Q series – it’s usually around the same price of the SM-58, but if you are on a budget, then that already is probably too much for you. Reviews say it is the same or better quality but maybe less robust. But that said – some people claim the Shure would survive being used as ammo for a tank. Do you need that kind of built quality? 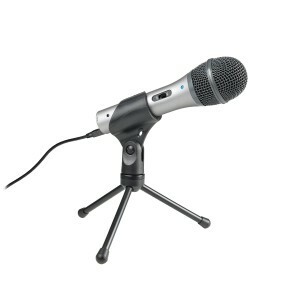 One thing never contested is iitsdurability – so if you are considering stage work of any kind and ned a mic that will survive being dropped on the floor – this is the mic of choice! The reason I include these here is that whenever I listen to podcasts done with a mic of this level – you notice the difference in quality. These are a step up from the mics before. It’s hard to describe, but these really up the production quality of any broadcast – they just are made to make a connection between the broadcaster and the listener. Rode Procaster – This seems to be the best compromise between quality and price. Professional yet not as pricey as the Heil. In my opinion and from the tests that I listened to, it sounds better than the Heil, but that might be personal preference. Anyway, of the two this would be the one I would love to try. Rode – send me a sample? Just kidding. 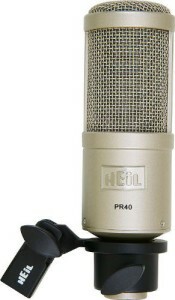 Heil PR-40 – This seems to be the podcasters dream, many pros use it and swear by it. But, well the price makes it unavailable to most of us! For using headphones when podcasting there are two reasons: Monitoring (listening while recording) and Mixing (listening while fine tuning). These headphones are very high-quality studio headphones considering that you can get them for $30 on a good day. I actually got my set a while ago via Amazon Warehouse deals – I got two pairs for less than the price of one. They got recommended via various youtube videos, and even professionals seem to think they are good enough for music, so they are good enough for me. They are definitely the best sounding headphones I ever had. I am sorry that I cannot give you any other alternatives – but I don’t know any other studio headphones. In this price range, I can’t simply go by reviews. I would need to test to say whether it would be worth using them. You need a popfilter for your mic – not that foamy thing you see reporters use (that’s a windfilter) but a popfilter. Basically a piece of nylon in a circle that you can put in front of your microphone. 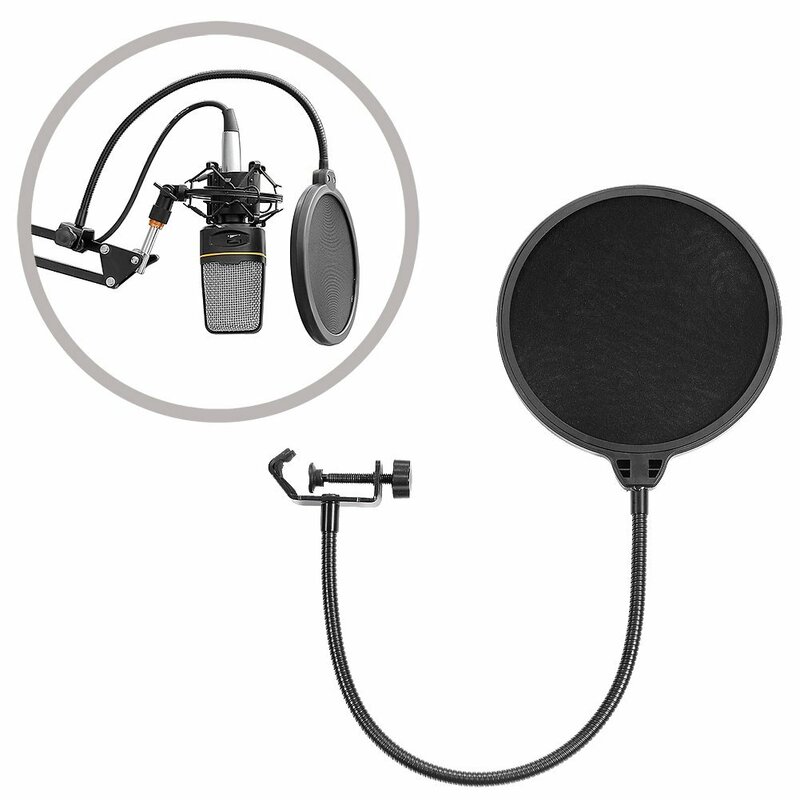 It will cancel out overly loud “p”, “t” and “s” sounds and… well, you need it, at least if you didn’t get one of the cheap dynamic mics with built-in popfilter, but even then you should probably add an external one as well! I could put a link for that below, but really: Just get the cheapest thing you can get – they are all the same. Look at the image below and then type popfilter into Amazon and get the cheapest. My BM-700 mic came with a useless XLR to 3.5mm cable. This allowed me to connect it with my internal soundcard – which of course doesn’t provide phantom power. The result was a very quiet microphone… So when you find yourself needing a real XLR cable, get a female to male XLR cable in the desired length. I own one of these – not too shabby, good for travelling or when you don’t have room for anything else. These are good if you have enough space. You might find something similar in the attic – every family with a wannabe musician has one! I don’t have one… I want one, and for the price I will get one soon! You need a piece of software called DAW (Digital Audio Workstation). DAW is the type of software that is used for any type of recording and music creation on your computer. but these are very limited entry level software tools. That doesn’t matter so much, though – you are not a professional musician, you are an entry level podcaster, and almost any DAW you use can fit your needs and produce great results. These two pieces of software are the most recommended tools for podcasts. Here is my recommendation – leave Audacity alone. Really! Stay away – if you are not already used to it – don’t bother. It’s complicated. It used to be cool when other software wasn’t available. But now it’s simply too complicated – it makes a lot of stuff that is simple and elegant in other software complicated and tiring. If you are on a Mac, you can use GarageBand. It works well for the start and should you decide you need more features in the future you can upgrade to Apple’s Logic software (which is the pro version of it!). But neither GarageBand nor Logic is available on both Mac and Windows, and since I use both systems, I wanted something that is available on both. UPDATE 2018: In the original release of this article I recommended Pro Tools First, Studio One Prime, and Ohm Studio. I don’t anymore. As of 2018 I recommend using Cakewalk (only for Windows) or Tracktion T7 (Windows, Mac, Linux). Both are available for free. Cakewalk is the old Cakewalk Sonar Platinum software – which has been bought by Bandlab and released for free. It has been one the major DAWs used industry wide for music. It’s definitely enough for recording your podcast – this software is completely free without limitations. Bandlab does not intend to charge for any version of this product so you get an amazing deal – but Cakewalk does come with a few kinks regarding the interface and editing workflow. However, I used it to edit several episodes of Marketing in Minutes – and it is definitely worth checking it out. It does come with several high-quality plugins and you can also use third-party plugins. Another DAW that has been making waves in the music world – Tracktion is a fully featured DAW that is available for a price in it’s newest version – or for free if you are ready to make do with the version that came before it. That version is currently Tracktion T7… But don’t underestimate that version. For your podcast, it’s definitely more than enough as Tracktion is regularly updated. T7 cost money only a couple of month ago. It’s similar to Cakewalk but with a little bit nicer interface. As a podcaster, you don’t need the more advanced features you are missing from Cakewalk – and I find that the workflow is slightly faster than in Cakewalk. Of course, third-party plugins are usable. Ardour is open source software and available for Linux, Mac, and Windows. But it’s not strictly speaking free. At least not when you are on Mac or Windows and want a compiled version. If you want that you can make a one-time donation and download the installer, or you can make a monthly donation and have full access for as long as you donate. That means you can get the software for a Dollar. Ardour is professional, but it does have one issue, the included plugins aren’t that good. Well, that’s not exactly true either – it does come with fully usable demo versions of professional plugins, but to use them without limitations you have to buy them, as these are paid plugins by a different developer. It also comes with a few free plugins from the Ardour team, but they hardly cover what you need. 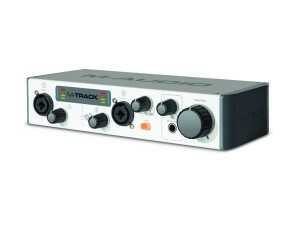 However, using free third-party plugins, this software becomes really good for podcasting. 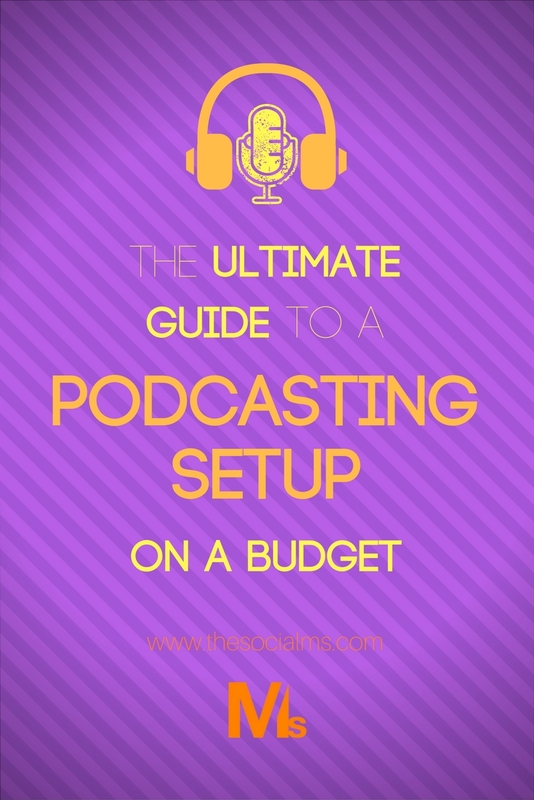 And when you get serious about podcasting, using third-party plugins will become a habit. So Ardour may be worth checking out. Another DAW worth checking out is Reaper – it costs 60 bucks, but it does have a trial version that doesn’t expire so you can pay them when you are ready. I don’t have experience with Reaper, but they have also released their stock plugins for free, and I use them in every DAW now. A lot of people swear by it, especially for Podcasting. And then there is also Hindenburg Journalist – which is specialized on Radio production. It costs 85 Euros, but they do have discounts on world radio day. Hindenburg is a DAW made for radio programs and podcasts. Update 2018: I don’t recommend Pro Tools First anymore – it doesn’t support VST plugins, which means adding third-party plugins is impossible. This is a huge downside, and as many of these plugins are available for free, it’s a huge downside right from the start. I’ve added free options for DAWs to this post that do support VST plugins. Pro Tools is the industry standard for DAW software. When you see high budget recording studios work with a DAW, it’s almost always Pro Tools. But Pro Tools is very expensive. But its creator AVID released an entry level version of Pro Tools called Pro Tools | First that you can download for free. It does have a few limitations, though: No plugin support other than what you get with the package, forced cloud syncing to AVIDs cloud and a maximum of three work in progress projects. It’s not that bad, though – the built-in plugins are more than enough for 99% of podcasts – and you can delete a project after you finalized the mix. Then you have a free spot again and can start the next project. If you are preparing to record 20 shows, then mix them all at once, and then start publishing – well, that won’t work. But if you roll as you go – like most beginners, then this might be for you. The built-in plugins are very professional – and if you go this route, it is recommended to learn them. Compressor, Equalizer, etc. are all far more advanced and produce better results than what other free options give you. The downside is that if you decide you need more, you will have to shell out $500 or more for the upgrade. Also – stability wasn’t that great when I tested it. Pro Tools is pro software from a different age, and although it is more comfortable to get used to as Audacity, it’s still not quite arrived in the age of visually pleasing software! Update 2018: I don’t recommend Studio One Prime any more as just like Pro Tools First it doesn’t support VST plugins in the free version. See better free options above. Presonus Studio One is quite a new kid on the block regarding DAWs. But it’s also got quite a growing following. Many people swear by its refined interface and say it’s better than Pro Tools. I am not the Guru; I don’t get to vote. But Presonus recently released Studio One Prime, a free version. It also has limitations – no plugins other than what comes with it, only two channels recording at once, a few other missing features, but it’s again free, and you can have as many projects as you like. There is no denying that the built-in tools lacking in comparison to Pro Tools | First, but on the other hand – you get more than enough to produce great podcasts. Give it a go. Studio One Prime is my choice – I like to be able to save as many projects as I want – and the upgrade route is far cheaper. The most basic paid version comes in at $99, and that’s probably all I will ever need. I also like the refined UI. Update 2018: Not recommended as there doesn’t seem to be a wide adoption of this. See better options above. This just gets an honorable mention. Ohm Studio is relatively new, looks a bit like Studio One and is focused on collaboration. It is probably worth a look if you are looking for something that helps you produce podcasts with multiple hosts in different locations, but it also does not just force syncing to the cloud, it is forcing you to work constantly in the cloud. Working on the train is impossible. I did record an episode of my podcast with each Presonus Studio One Prime and AVID Pro Tools | First. Pro Tools | First was leading regarding features and regarding the quality of tools, but the cloud sync put me off, and it is kind of unstable and picky about audio interfaces. Studio One Prime is probably more than enough for at least 90% of one or two man shows. It is a lot more fun to use – and similar to GarageBand it comes with quite a bit of music loops and sound effects. While the AVID entry-level solution might be more professional – upgrading would later come at a price. So it was Studio One Prime for me. Ok, this article got massive – but I hope it was worth reading for you. This is what I have learned until now about podcasting. While it is very important to get a real audio setup, what decides about your recording quality is your way of talking on the show. If you now have your setup – take some time to learn the ins and outs. Watch some youtube videos on how to apply compression to your voice, learn to listen for subtle changes, etc. My current setup cost me far less than $70 and that is already counting all the stuff I already had into the total price. You can get going for this and then continue upgrading on the way. 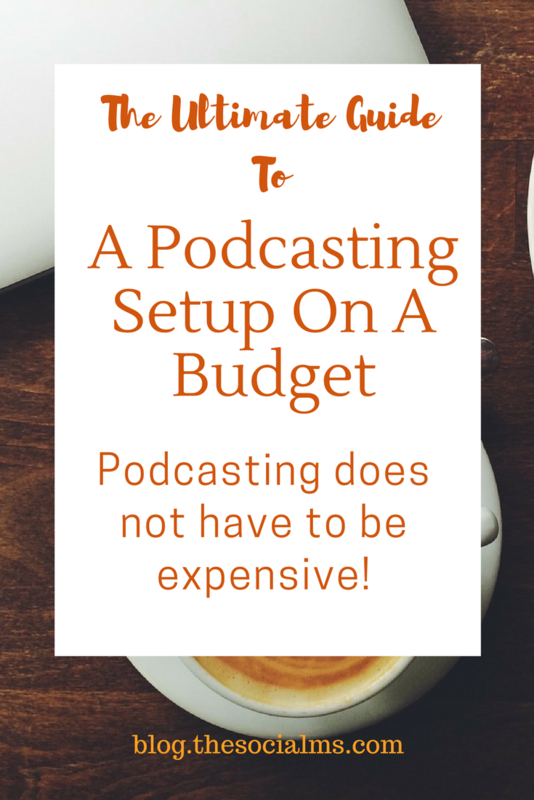 How much did you spend for your podcasting setup?